20160610 - Up in the am and L&D already gone to get to his games. JG&I stumbled out of the house and made it to his G's game just in time. We had our tarp and strung it up over the team, good thing it was HOT! 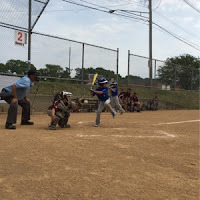 G had an ok game, no hits for G, but they won 18-4. G&I stopped and got pizza on way to D's game. To D's game and it had just started. 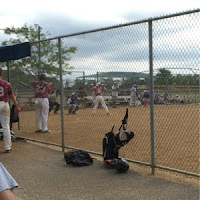 D played catcher the first game and had a couple of really nice hits that were unfortunately fielded perfectly... They lost game 1 and D sat the entire second game and they lost. J&I bailed out when we found out D was not playing and hit a couple of auction houses and got the Gilroy nightmare rental property closing docs signed off, and picked up the new cook top at Lowe's. Home and hung out on the back porch a bit.